Description: The Double Hitch Bracelet features the Alternating Half Hitch. 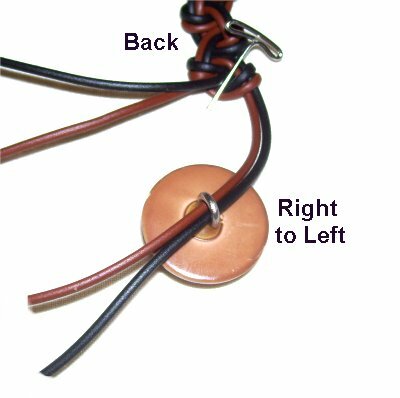 This basic jewelry design is made with leather or a waxed material, so the knots hold their shape. This Macrame bracelet has a loop at one end, with a button at the opposite end, for the closure. Janne Pedersen sent in the suggestion for this project. Step 1: Cut two cords, each at least 72 inches long (up to 8 inches). Unless you are using leather, prepare the ends with tape, glue, or wax to prevent unraveling. 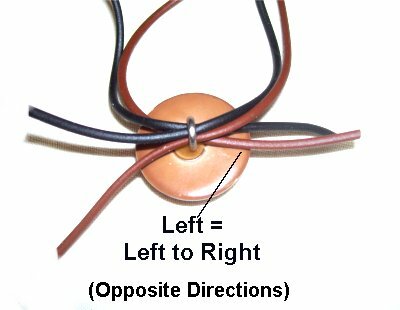 Make sure to use the Cross Pin Technique (or tape), when using Leather, Satin, or other types of delicate cord. Step 2: Fold both cords in half, and secure them to your project board vertically, so the ends are even. The two cords will act together as if they were a single cord. Step 3: Leave a space large enough for the button to pass through, between the fold and the first knot. To make the first Half Hitch, use the right half of the cords. Pass them over - under the two on the left, in a clockwise direction. Pass over the right half as you pull them to the right. 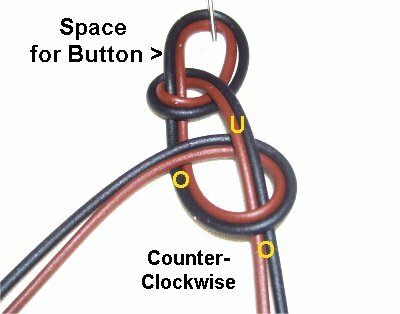 Step 4: Tie the next Half Hitch with the left half of the cords, rotating in a counter-clockwise direction. This Half Hitch is made the same way, over - under the cords on the right. As you pull to the left, pass over the left half of the cords. Step 5: Repeat steps 3 and 4, alternating back and forth between the two sets of cords. Stop when the Double Hitch Bracelet is the size you need. Step 6: Secure the Double Hitch bracelet to the board, so the last knot cannot move. Flip over the bracelet and position the button so the shank is facing up. Pass the two ends on the right through the button, right to left. Slide the left ends through the shank left to right (opposite direction). << Choose one cord from each half and tie an Overhand knot. Add glue near the shank, and tighten it firmly. 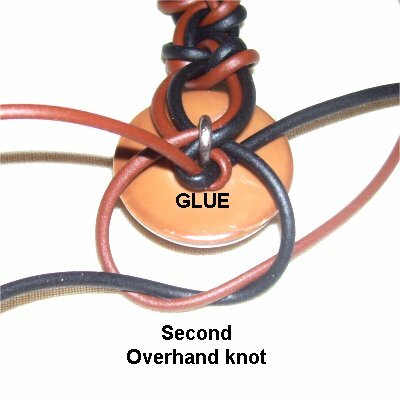 You can add more glue to the top of the knots if you wish. When the glue is completely dry, cut off the excess material. Have any comments about the Double Hitch Bracelet? Contact Me.